First of all...great website! It's funny how so many of us crave our own little piece of heaven in the bush. I've learned alot from the postings in the past (thank you all for sharing your projects and experiences!) and have finally joined in now that I have something to celebrate with the rest of the folks! 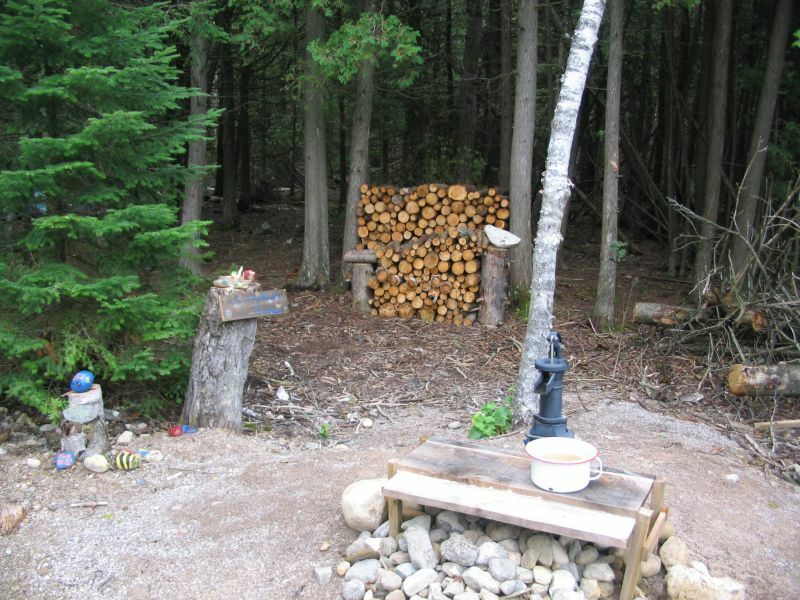 About a year ago we purchased two acres of bush near lake Huron and have since put up a bunkie, outhouse (luvable loo compost toilet) and had a well drilled this summer. 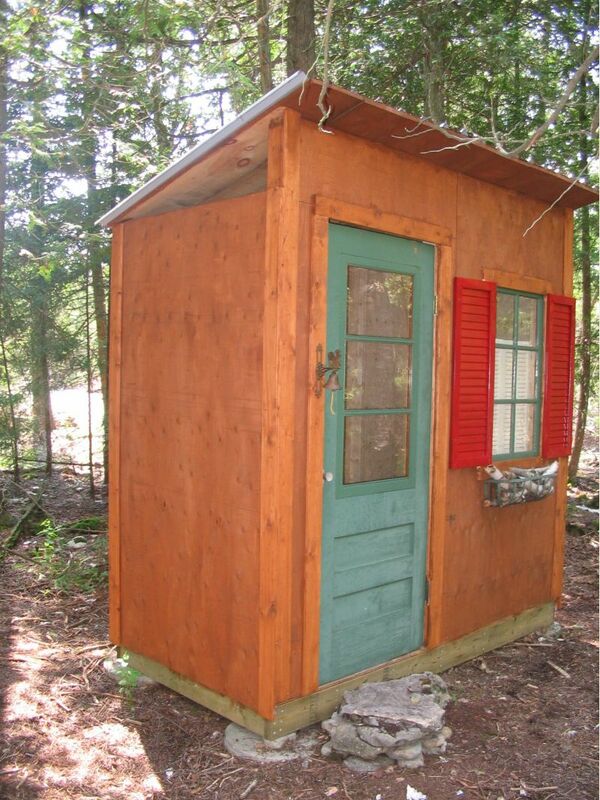 The bunkie sits about 13 - 14 ft high. Main floor is 6'5" under the loft area and the loft is 6' at the peak. It's 2 x 4 framing and made primarily of 1" - 1 1/4" barnboard planking. 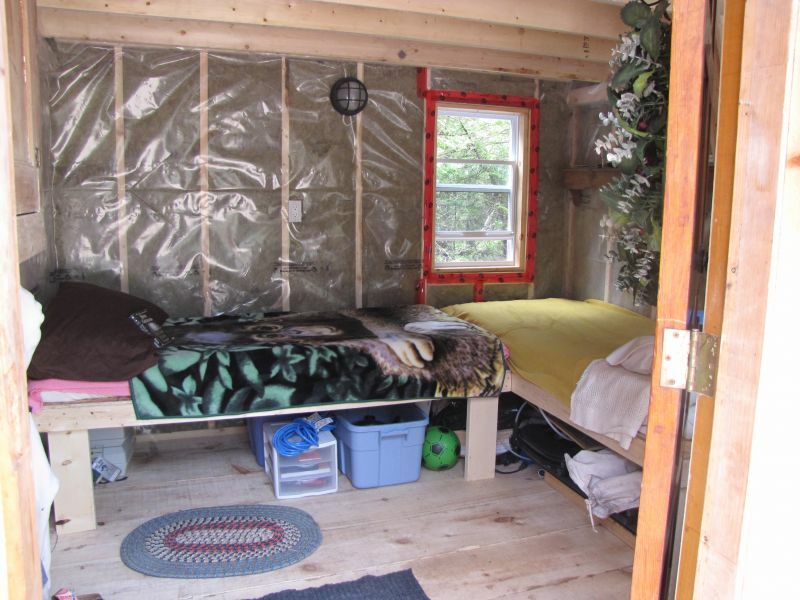 It has an additional 4' overhang so my wife and I can sit in our mainfloor bunks , open the door and watch the rain when the weather's not great. We're working on storage solutions for under the bunks and I've installed a few cabinets as well. It is now insulated and wired with a 2000 watt generator. This is used only when needed, as we prefer the peace and quite of our surroundings. We picked up the door and three windows from a Habitat Re-store...the door, window and shutters for the outhouse are all "curbside treasures". 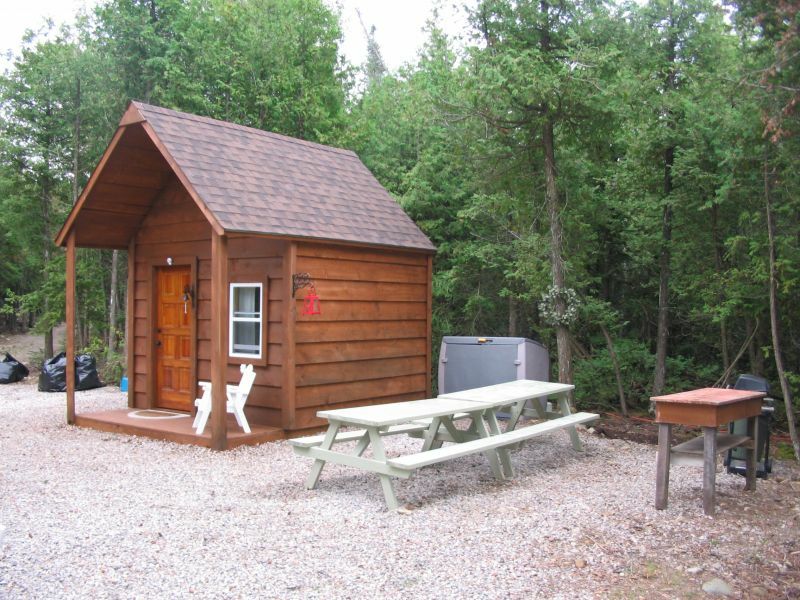 The bunkie looks out to the bush...but Lake Huron is a 5 minute walk at the end of our road. My next project is to heat the bunkie...I was able to pick up a reconditioned coleman gravity propane furnace that was salvaged from an older RV. 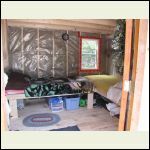 These vent out of the bunkie through the the double pipe, while bringing in fresh air. It's about 10 - 15000 BTU, so I'm hoping it will do the job. Very few working parts, no blower, so no electricity required. Simply runs off a propane tank. My other projects will be building an outdoor shower and an organized cooking area, where pots / pans can be stored, etc. Any thoughts / ideas welcome. nice camp you got there! any construction photos documenting the build you can share? 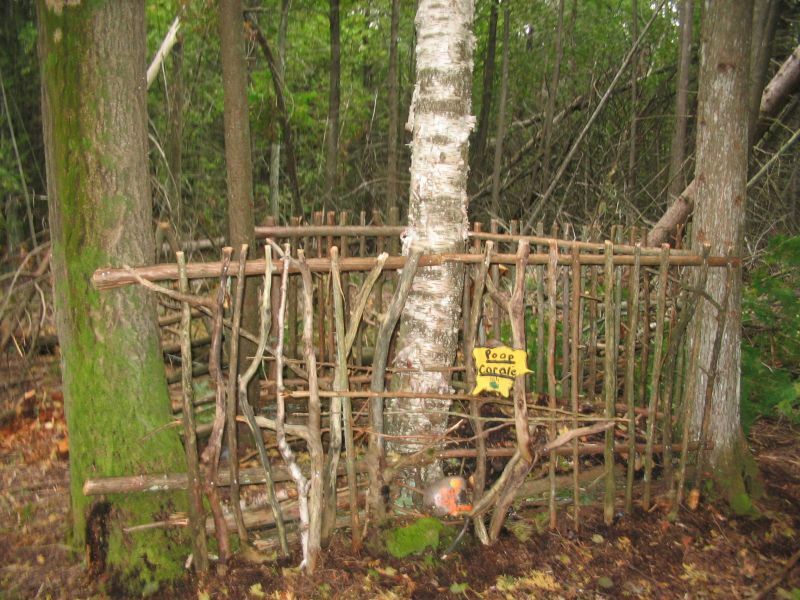 That is a super Outhouse! What a great looking cabin and "loo". Hope you enjoy it. 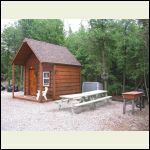 The small cabin size does have its challenges for gear storage and cooking but we found they are not insurmountable. Your heating suggestion sounds like it will work well. We found it helps to have some sort of air circulation or else you will end up with the loft reaching +40C and your feet will still be freezing. 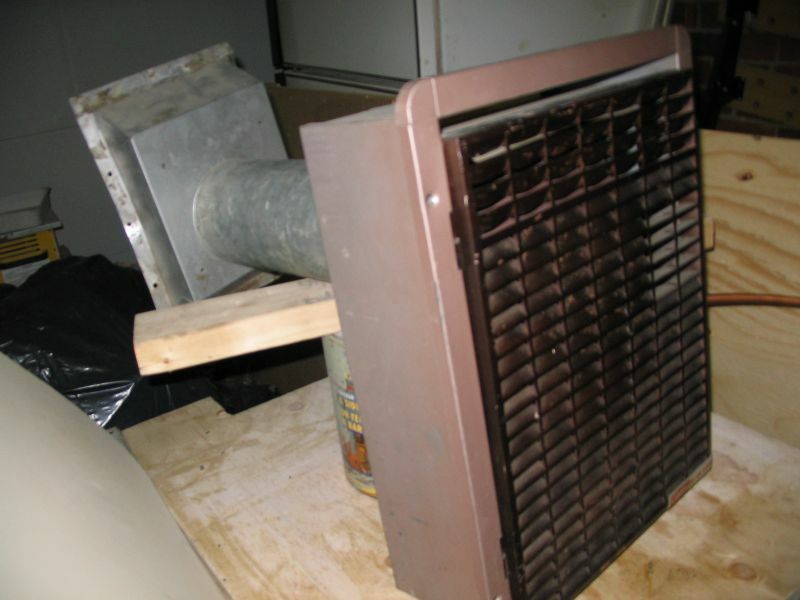 A simple dc oscillating car fan worked well in our situation to distribute the heat more evenly. Fabulous cabin! I love the little bell outside the outhouse door. *S* Keep us posted with updated pictures as you get them. She's on board with the cabin experience...as long as she has a nice outhouse! Thanks Hattie...it's a work in progress! Hi bugs...thanks for the kind words...yup...working with 100 sq. ft does have it's challenges...unfortunately in Ontario that's all you are allowed to build without a permit. 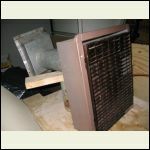 I'll let you know how the RV furnace pans out once I install it. How big is your cabin?? I'm new here and still trying to figure things out. 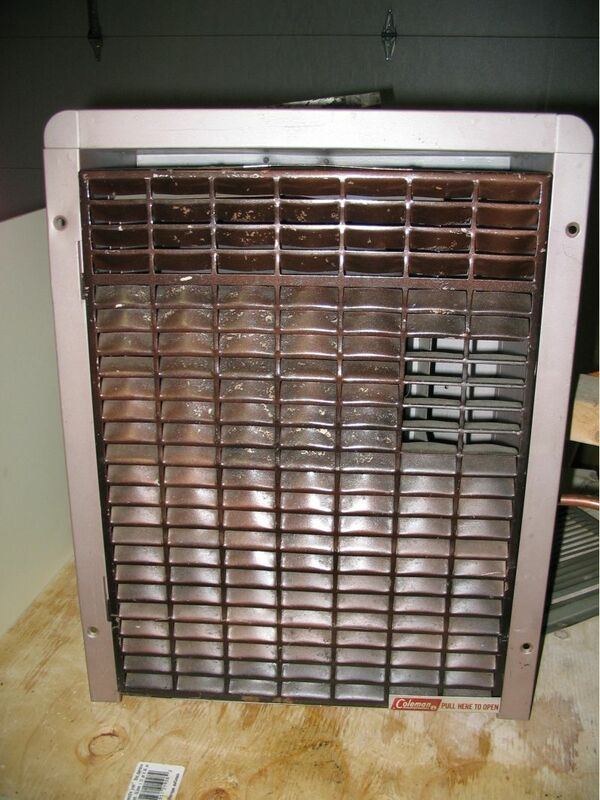 The salvaged gravity vented furnace has been cleaned and is ready for the install. It's little, but it's my sanctuary. 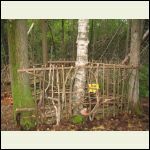 Many of you have created some wonderful projects....keep the pics and ideas coming...it's a pleasure reading about your projects...a bunch of kindred cabin spirits. Looks like you have all the essentials in place. Hope the heater works for you. Our little shed is 77 square feet inside no loft. We have 6 inch walls so we have lots of insulation. Much better than a backpacking tent. There is a thread on the forum re our endeavors when you are bored and need a laugh. Had some good ideas and bad ideas just like most. But that is what the process is all about. The Loo looks like a double seater. Where'd you get that well pump? We will be shopping for one as soon as we test out our newly found well. cool camp. I have an idea for you about a kitchen area. I believe that you could build a kitchen/sink/small storage area without a permit if you basically build it just like a bay window. It doesn't change the square footage of the structure, so it shouldn't be a problem. (permit I mean) If you use RV size sink/stove, you need to cut out and make a box about 48 in. wide by however tall you need for storage or whatever and 24 in. deep. 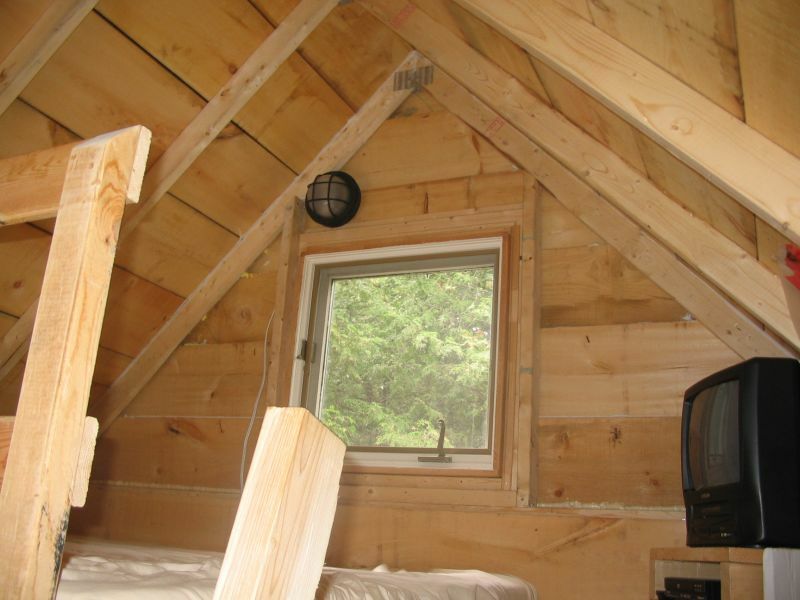 Also you might consider boxing off the floor joist(s) with a small piece of plywood. That would give you overhead storage (sort of like overhead drawers without the faces). Also cup hooks are a great space saver/storage alternative. Very cheap also. Best of luck. The ol "poop coral" seems to doing it's thing (named by my nine year old...he made the sign). Seriously, awesome part of the country...I travelled through there on my way to Yellowknife years back...now that was cool cabin living up there! Thanks for the kind words...my wife's one condition for joining me on my cabin adventure was that she at least be able to "pee in comfort"....hence the nice loo. The shutters, windows, door were all curbside treasures...I put in a mini solar panel and light for the midnight visits...and of course a magazine rack!!! I can tell you that using peat moss and following the instructions from the "lovable loo human compost website" really does work...no odour and breaks down pretty quickly once it's been dumped in the compost coral. Re. the pump.....Not sure where you're located, but in Ontario we have TSC stores.....Farmer Hardware store...everything you can think of. They carry the hand pumps for about a 100 bucks. Ours works slick.....little labour, but great water. The website : Survival Unlimited seems to carry a selection as well...just google. cool camp. I have an idea for you about a kitchen area. 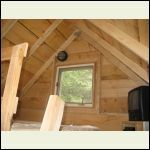 I believe that you could build a kitchen/sink/small storage area without a permit if you basically build it just like a bay window. It doesn't change the square footage of the structure, so it shouldn't be a problem. Hey, a couple more potential projects this summer..Thanks. I never thought of the bay window concept...that's why this is a great site to share ideas. If you're in Canada, your building code will likely define building area as "the greatest horizontal area of a building above grade,within the outside surface of exterior walls". So it won't be measured just at the floor level; it will be measured at whatever sticks out the most, roof overhang excepted. It was 0C on the weekend...T shirt weather for us. This morning it was -28C with a -36 wind chill. Tonight is supposed to be colder. We do like to whine about our temps in SK but not as much as S Ontareaireo. Do you make a "deposit" into the pooh corral by the pail full and then cover the deposit with a mulch material? We dump each pail full into large garbage cans with leaf mulch/mold. After two years or so we are going to dump the can contents into an open air composter like your corral. Or at least that is the plan. Never been to Yellowknife altho I used to do work from up there diamond mines, gold mines and hydro projects. We did the Alaska Highway a number of years ago. (Tented the whole way. That was when we learned to dislike RV's.) Was interesting history and Robert Service, P. Berton stuff, but overall we found the scenery somewhat boring except on a side trip up the Dempster Highway. I guess we were used to Yoho Park. But the Alaska Highway was not built for tourism and scenery... A very different time and different situation. We deposit each five gallon bucket into the corral. The fresh bucket starts with a 3" layer of peat moss and every subsequent "deposit " gets covered in a 2" layer of peat moss. I just buy a large bag of peat moss from the Nursery and it lasts most the summer...the peat moss also makes it flow out of the bucket much easier and cleaner. Once dumped in the corral, I throw another few shovels of peat moss over it. We've only been doing it for a year, but I'm surprised at how quickly it breaks down...and no smell. At some point we will recycle it into a wildflower garden...my wife's idea. Weather wise here in Southern Ontario...we're getting dumped on...just got in from shoveling the driveway again! Tranquility has been restored...all is good with the world again and yes, if you didn't guess, I made it to my bunkie this weekend. Highway was closed by police (so we went inland)...white outs everywhere (so we drove slow) and then out of the blue...wind stopped and the sun came out for the last hour of the drive to the bunkie...like mother nature was saying..."OK...I just wanted to see how bad you needed to come up here!! All's good...everything safe and sound...tree fell across my lane way, so a great excuse to pull out the chainsaw. Here's a funny one...I use to always put Irish Spring soap in my tent trailer when I stored it in the winter to keep the mice out...never a problem...always worked. Tried the same thing at the bunkie...5-6 bars spread out on both floors...well, something (rambo or very hearty bush mice) had a feast on my soap and the square bars were now little round balls ...these little suckers had a poop fest as well!!!! Drive home much nicer...beat the 9"of snow by about an hour! "Manly yes....But I like too!" Hey CabinBuilder...it is good for the soul, isn't it? You're up around Bancroft area, aren't you? Yeap, just ~10 mins drive from the town. 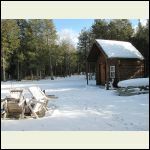 Indeed, it is a different/special experience to cabin during winter. OK....I think I have my boys hooked (age 10 and 12). They said if I don't take them to the bunkie this weekend, I have to haul the tent trailer out of the garage and put it up in my driveway for them to sleep in on Saturday...sigh...does my heart good....though I'm not to sure about how my back feels...that trailer gets heavier every year to haul out !! though I'm not to sure about how my back feels...that trailer gets heavier every year to haul out !! Hey, bush, ain't that what 10 and 12 yr olds are for??? this is why they call you the wise one......."hey boys, Dad has a special chore for yah!" I love your camp. It looks great and seems really functional. thanks Badger....it's a work in progress. 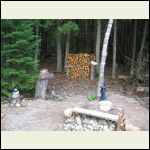 this year i want to cut a lot of deadfall, like you're planning to do...let them dry out and perhaps try my hand at a small log cabin next year. How's your planning coming on your new property in Oregon? It's an exciting time eh?...nothing like seeing a dream unfold! Nice setup. I am doing similar thing. 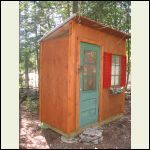 I have an outhouse with a composting toilet separate from a 100 sqft Bunkie near Georgian Bay. from your experience would be appreciated. I just got the composting toilet. Have not used it yet. Same thing, a high priority with wife. 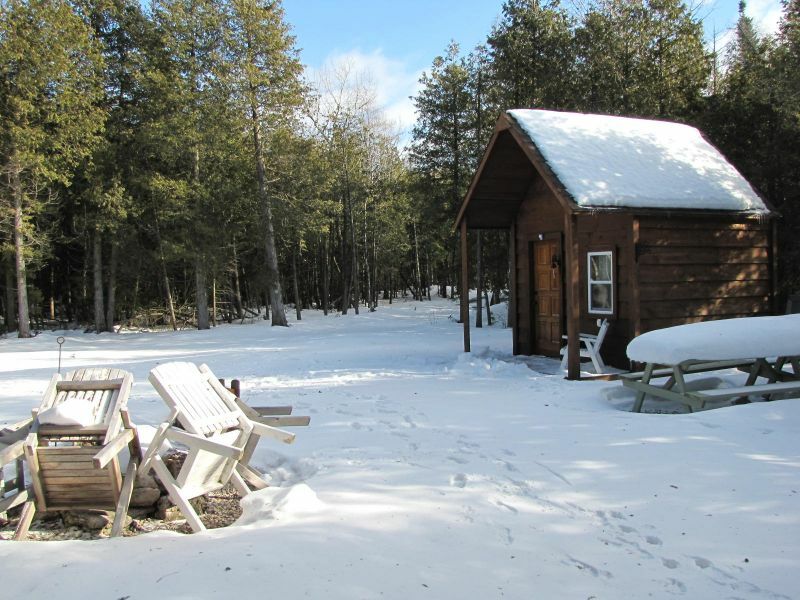 Are you using your place in the winter or late fall and early spring? 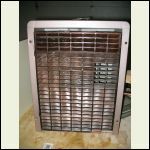 Do you have issues with moisture and insulation? the insulation and siding. I have no heat or electrical yet. That is what I hope to set up this summer. spray foam the cathedral ceiling. This seems to avoid venting and vapour barrier problems (I have 2x8 beams on the roof giving R42). It seems very expensive (I need to really calculate how much it will cost, maybe way too much) but maybe worth it. Otherwise I do have the ridge vented. I would then have to put those foam ducts in lose 2" and have only about 5" of batt insulation. (R30?) and then worry about the vapour barrier and soffit vents. I only have 2x4 for the walls. Now I am thinking of a thin ( 1-2" thick ) layer of spray foam (to leave room for electrical in the future). That seems to give the 100% wind shield which should be good. After that for insulation on the outside should be really important because the 2x4s seem to leak the most heat. There is a lot of framing around the windows, so I am thinking the foam should help...on the other hand the way I put the windows in, there is not much thickness available for the foam outside unless I put some kind of spacers and pull the windows out a bit. . That would not be so much work....I am thinking out loud now.